India on Tuesday test-fired its medium range nuclear capable Agni-II missile with a strike range of 2,000 km from Abdul Kalam Island off Odisha coast, defence sources said. The Intermediate Range Ballistic Missile has already been inducted into the services and the test was carried out by the army's strategic forces command with logistic support provided by the Defence Research and Development Organisation, they said. The 20-mt-long Agni-II ballistic missile has a launch weight of 17 tonne and can carry a payload of 1,000 kg over a distance of 2,000 kms. 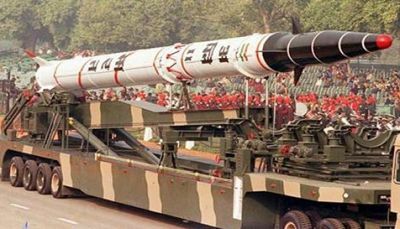 The missile is part of the Agni series of missiles which includes the Agni-I with a 700 km range, Agni-III with a 3,000 km range, Agni-IV and Agni-V both having long range capabilities. The first proto type of the Agni-II missile was carried out on April 11, 1999 and last launch was a user's trial on May 4, 2017.